This book will help you to maximise the harvest from you planting box! Using a planting box to grow vegetables is more convenient in several ways – it is easier to clear weeds and to fertilise, no heavy digging is needed, you can start the growing season earlier in the spring, and it is easy to make a small green house. In addition, it works just as well on the balcony as in an urban patio or a large garden. This book by Eva Robild, author of several successful books on gardening, takes you deep into the soil to provide useful information for beginners as well as those who want to improve their growing. 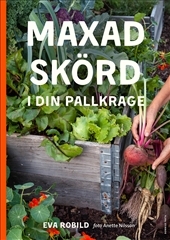 It is an inspiring and practical book about how to get the most from your gardening.